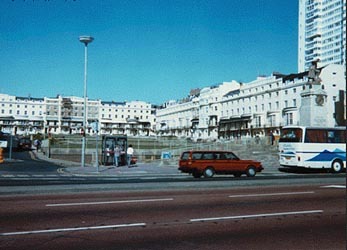 An attractive square from the Regency period which contains a landscaped underground car-park. If the money became available for a similar project again, it might be better to get it right rather than consider alternatives. Some of the odd facts that I have picked up since I moved here in 1985 include: (1) This area used to be known as ‘The Jewish Quarter’ probably due to the high Jewish population that now appears to have moved to Hove. Mitre House (Western Road) certainly has many Jewish prayer symbols on some of the flats’ front doors. I used to be so amazed with the amount of well dressed and immaculate ladies that always had such perfect hairstyling – alas this is not so obvious nowadays. (2) Dampness appears to be a problem with the lower ground floors of the Regency Square buildings which, I was informed some time ago, occured after the underground car park was built. Apparently the pressure exerted by this unnatural addition caused the underground water pressures to be increased causing water entry into basement areas. I wonder if these two statements are fact or fiction?